$10,000 Water Damage Challenge Grant! Help the show go on! Park Square Backstage Flooded. $10,000 Challenge grant in place to double your gift and meet the $20,000 goal. You know how cold it was during the Polar Vortex. Saint Paul recorded its coldest temperatures since 1996 (and before that 1887)! 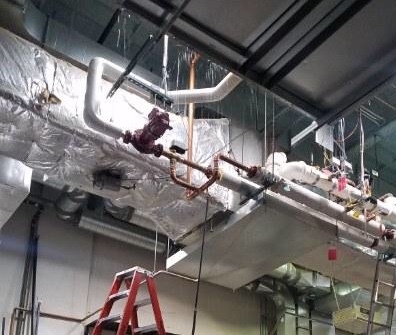 Imagine the shock as Park Square’s technical staff came in Wednesday morning, January 30 – bundled up against the cold, coaxing their car batteries to start – to find a cascade of water falling from the ceiling of the scene shop due to burst pipes in the building. Water pouring in above the scene shop. The drains were quickly overwhelmed. 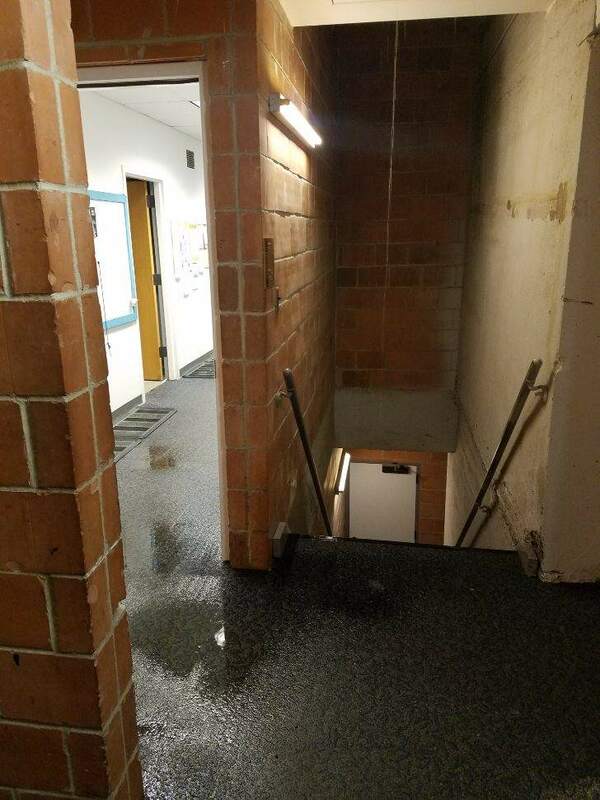 Water cascaded into the technical office, dressing rooms and green room, eventually forcing the sewer lines to back up. Ick. Yes, the cast’s shoes were submerged in you-know-what. The damage is extensive. The room holding the furniture and props for our 20th anniversary production of The Diary of Anne Frank was flooded. 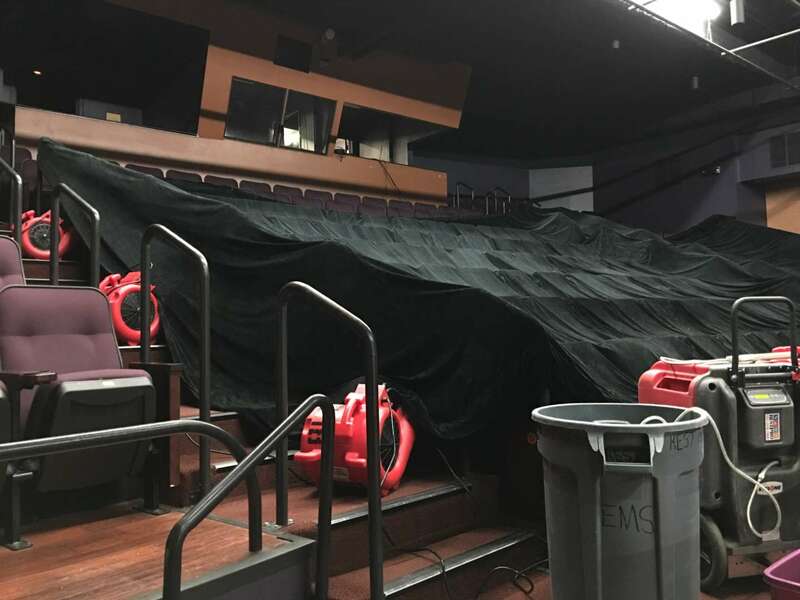 Crews are busy rebuilding and painting set pieces, replacing shoes, drying out the stage curtains and creating temporary dressing room for the valiant cast of Girl Friday Production’s upcoming show The Skin of Our Teeth, which opens Feb 9. A large curtain being dried. Early estimates are that there will be a $20,000 gap when all is said and done. And you need us to be ready to welcome 25,000 more teens this spring for field trips to Antigone, The Diary of Anne Frank and Romeo and Juliet. You can make sure the shows go on at Park Square! Please make a gift to meet the $10,000 challenge match and the $20,000 goal. Volunteer to help move stuff and repaint. When you give today, you will join the heroes of a record-breaking cold, wet, smelly, spirit-crushing day. The entrance to the dressing rooms. Your pantheon of heroes includes these all-stars Gaea Dill-D’Ascoli (Assistant Technical Director), Dave Peterson (Facility Director), Gabe Salmon (facility associate), Mary Mongtomery-Jensen (Interim Production Manager), Trevor Muller-Hegel, Eric Hofstead, Allison Oberg, Rachel “Olli” Johnson, Peter Talbot, and Anna Lund. On your behalf, they are working around the clock with the remediation company, assessing damage, making inventories, cleaning up (you don’t want to know the details), and getting your shows ready with amazing artists. Thank you for being the friends that keep the show going for your whole community. With you on our side, we can do it! P.S. And if you haven’t picked up on the irony, The Skin of Our Teeth follows the eternal family through the Ice Age, a great flood and a world war with their hope intact. You are our hope! PRIME PRODUCTIONS brings the future to the stage. Searching for Justice with Ellen J. Kennedy Ph.D.